청자 퇴화선문 표주박모양 주전자는 윗 박의 규모가 작고 수직상태로 누른 여섯 개의 선으로 장식하였으며, 아래 박은 양감이 풍부하고 저부가 크게 팽창되어 밑으로 쳐진 듯한 형태를 하고 있다. 특히 나팔의 벌어진 끝 부분과 같이 넓게 벌어진 높은 굽이 받치고 있으며 표주박 형태의 몸통에는 아무런 문양장식이 없다. 몸통이 완전한 소문인 것과는 달리 주구(注口)와 손잡이는 가늘고 섬세한 음각과 반양각을 써서 대나무의 어린 싹과 마디를 소재로 하여 기하학적 분위기로 재구성하였는데, 그 음각과 반양각이 새겨진 선을 따라 흰색 백토로 퇴화점(堆花點)을 질서 정연하게 찍어 넣었다. 손잡이와 몸통의 연결부는 마치 가는 대줄기를 꼬아 감으면서 부착한 것 같은 형태를 하였으며, 주구는 어린 죽순의 형상을 조금 변형시킨 형태를 하고 있다. 유태의 색은 엷은 녹색을 띠는 맑은 회청색이며, 유층에는 미세한 기포가 꽉 차고 약간 두꺼운 편이며 부분적으로 망상의 빙열이 있으나 짧고 깊게 나타나며 저부와 굽 주변은 완전한 상태이다. 나팔과 같이 벌어진 굽은 별도로 만들어 붙인 방법을 썼으며 접지면에 백색 내화토 비짐을 6개소 받쳐 구워서 비짐이 있는 부분은 조금씩 눌려진 상태를 보이고 있다. 문양이 없는 표주박 모양의 병 몸체에 주구와 손잡이를 붙인 청자로 주구의 손잡이에는 대나무 문양을 상감기법으로 처리하였고 사이사이에 퇴화점의 대담한 처리가 돋보인다. 당당하고 안정된 기형에 유려한 곡선미를 지닌 형태로 비색(翡色)의 맑은 유색(釉色)과 최상의 태토(胎土)로 만들어진 기품 있는 12세기 청자이며 고려시대 도자사연구에 귀중한 자료이다. 손잡이는 2군데 균열부분을 접합하여 붙였다. The upper part of this object is much smaller than the lower part and is adorned with six vertical lines around the mouth. The large lower part gives it a sense of stability. The bottom is wide and high. Its gourd-shaped body contains no patterns at all. The spout and the back handle are adorned with geometrical patterns that look like sprouts and nodes of a young bamboo by means of thin, delicate depressed engraving and semi-relief engraving. Paste-on-paste dots are made neatly -- using white soil moistened with water -- along the lines made with depressed engraving and semi-relief engraving. The part connecting the handle with the body looks like a twisted bamboo stalk. 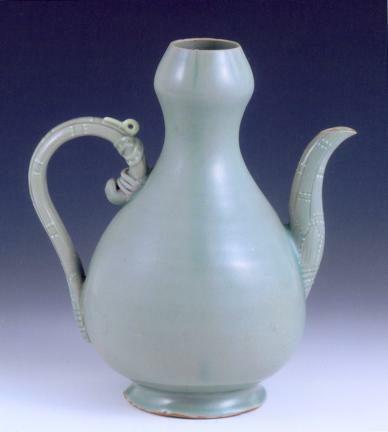 The spout resembles the sprout of a young bamboo. The bottom was separately made and attached to the body, just like the spout and the handle. The celadon, which dates back to the 12th Century, was made with transparent glaze as well as the best-quality source soil. It has the imposing, stable shape of an object with linear beauty.